How to Plant Fruit Trees - Tree Care - Vintage Tree Care Inc. There can’t be enough stress put on planting your fruit trees correctly. 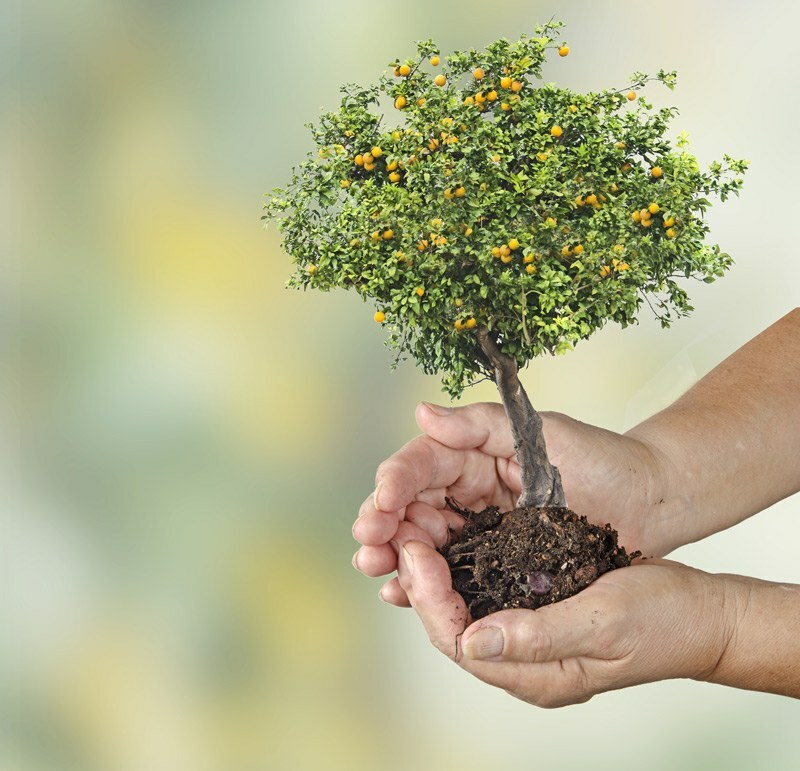 The treatment you give to the planting process and subsequent first year of growth will help to establish a healthy root system and healthy tree. Vintage Tree Care will walk you through some of the basic questions you need to answer before planting your fruit tree. Which type of fruit tree do you want to grow? Do your research! There are many factors to take into account: Taste, winter hardiness, chill hours, size, does it need a pollinator, what types of tree are best suited to your climate. Ask for help from a nursery or supplier that can help you determine the best time to plant your fruit tree. When: Winter (dormancy). Typically mid-November through late February. While container stock can be purchased and planted at any time of the year, unlike bare root stock that is only sold during dormancy, the least stressful time of year for the trees is during the dormancy period. In order to narrow down the type of fruit tree you would like to plant, it might help to think about the type of space you have to work with. Depending on the size of your yard or orchard, you’ll want to think about planting either an orchard tree or a smaller dwarf tree. Orchard trees such as apple, cherries, peaches, plums or pears, will require on average about 10 to 12-foot spacing in your backyard or orchard. Fruit trees can be spaced as closer if you have limited space in a backyard and are not attempting to grow commercial type yields from your orchard. If you are going to grow fruit trees in a small space, you’ll need to implement close-planting and likely summer pruning techniques to keep your trees a manageable size. Dwarf trees can be grown in a smaller, approximately 6 to 8ft diameter space in comparison to the larger space required for non-dwarf trees. Soil, light exposure, and water drainage will be key factors in the success of your orchard. A slope can be a good location, should you have one, as it will be optimal for light, water drainage, and air flow. Just be sure you’re not planting in any area where there is frequently standing water. You’ll want to assess the type of soil you’re working with – Whether your site has soil of good enough quality to use as is or if you’ll need to build up your soil. If your soil is sandy or hard clay, you will need to build it up for each individual tree. Although different trees have specific soil types they prefer, generally speaking, fruit trees will thrive in a well-drained soil with a medium loam texture and some sand. If you receive a fruit tree with the bare roots wrapped in plastic and paper to keep moist, you can keep them wrapped for a short period of time if caution is given to keep them in a cool place away from large amounts of light (this will minimize the likelihood of inducing growth early). However, opinions vary on this and many suggest planting the day you receive your fruit tree, if possible. Using a shovel, you can start to dig. Your hole needs to be dug deep enough to accommodate the length of the roots and no longer. Trim any broken roots and if needed, prune roots that are too long to be placed within the hole you have dug. It is a good practice to remove the grass or similar competing weeds, etc. from around your hole to reduce competition with your tree. A 3-foot diameter circle of removed grass around your hole should be plenty space. Leave a small mound of dirt at the bottom of the hole to place the roots on. Typically, you do not need to apply fertilizer to the soil you are planting in. Place the tree into the planting hole, taking caution not to damage or break any of the roots. Be sure to place the highest originating root at or slightly above grade to minimize the future likelihood of root rots. Do not bury the graft union on grafted trees and also orient the graft union away from the South Western exposure. The trunk tissue closest to the graft is highly susceptible to sunburn. 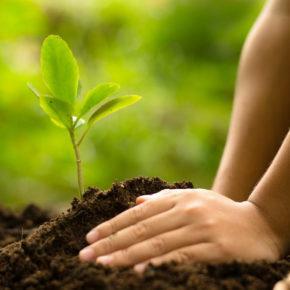 Now, shovel your soil onto the roots while holding the tree sturdily in place. Ensure that your roots are going out to a straight point and are not wrapping around the hole. It helps to wiggle your tree a bit as you’re applying the soil so that the soil can properly settle around your bare roots. Water the soil to allow for settling and add soil as needed to fill the hole properly. With your hands, move soil away from the trunk of the tree to identify the root collar (area where trunk tissue swells and becomes root tissue). Dig a hole slightly less in depth than the distance from the root collar to the bottom of the soil ball. This will allow for the root collar and graft union to remain above grade. Once you have your hole dug, carefully remove the tree from the pot and keep the compacted soil around the root system. Check for any signs of roots circling around the edge of the root ball, as these can become damaging to the tree as it grows – prune any circling roots you notice. To ensure you have the proper depth, you’ll want to make sure the highest root on the trunk is right at or slightly above soil level. Place the tree into the hole. Then build up the soil around your roots and give the tree a nice good soaking once you have covered the roots with soil. After watering, cover the soaked base with either more of the soil or a mulch mixture to allow for proper filling of the planting hole. Planting fruit trees in a backyard orchard can be a wonderfully rewarding experience but will take time and dedication to ensure they begin to bear fruit in the years to come. By implementing proper planting techniques for your trees, you’re taking the first step forward towards a successful orchard.